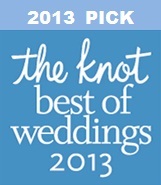 We liked more contemporary pieces and they had a lot of pieces to choose from, which really helped us in selecting them! "Brian, Father of the Bride"
Father of the Bride here. I'd give a 6.0 if I could! Professional, responsive, flexible, and most of all truly elegant music. Worked very well with our wedding coordinator. I personally didn't have the opportunity to chat with the musicians, a tribute to how well and seamless the event went as they moves from prelude to ceremony to cocktail reception. If you are going to splurge on one "extra" for a wedding, make it Elegant Ensembles! "Kathy, Mother of the Bride"
Mark and his Trio were absolutely amazing! They were dressed very appropriately, and sounded beautiful! We didn't have a wedding coordinator, but they were able to easily figure out what songs to play when. We would definitely recommend Elegant Ensembles to anyone in North Carolina! 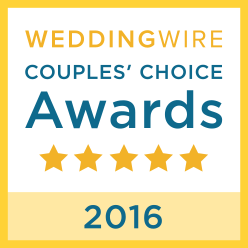 Mark and the Elegant Ensembles were very professional, easy to work with, great with communication leading up to the wedding, sounded beautiful, and were very reasonably priced. Would definitely hire them again! "Karen, Mother of the Bride"
As mother of the bride, I wanted my daughter's wedding ceremony to be grand. And grand it was! Elegant Ensembles played an amazing selection of music. I spoke to Mark about the songs my daughter and her husband had chosen and he assured me that they could play them. I admit I was extremely nervous because I had never heard Elegant Ensembles perform before. I am a self proclaimed control freak so this was adding to my tension. When I arrived at the church and heard them perform, I was so relieved. The music was fantastic. In fact it was so good that the priest said from the altar that he had never heard such beautiful music at a wedding ( and he does a good amount of them). Elegant Ensembles is a truly professional group of musicians and I highly recommend if you want an very memorable and outstanding performance. The only thing that I ever envisioned for my wedding was my bridal procession song played by a string ensemble. 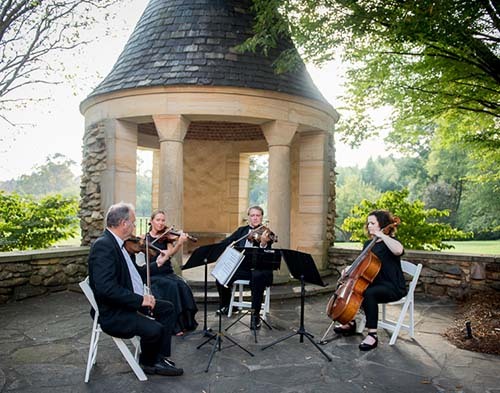 After reviewing local groups and their music samples, I discovered that Elegant Ensembles was the perfect group for my wedding given their tasteful, classic, and professional presentation and well balanced music performance. I had a couple of girlfriends approach me after the wedding ceremony saying that they "HAD to get the information for the string trio". Mark was flexible with the pieces as I asked him the week before the wedding to add a unique flair to the recessional music… he did a great job!! They have a variety of musical selections and a long list of them, at that! We had heavy rains on our wedding day and I never heard any complaints out of the group even though they were working with instruments. As I walked down the aisle to Pachelbel's Canon, I finally lived the only vision I had for my wedding. That's a lot of pressure for any vendor, but Mark and crew made it happen perfectly. If you're looking for a string group in Elegant Ensemble's area, you'd do yourself a favor to give Mark and company a look.